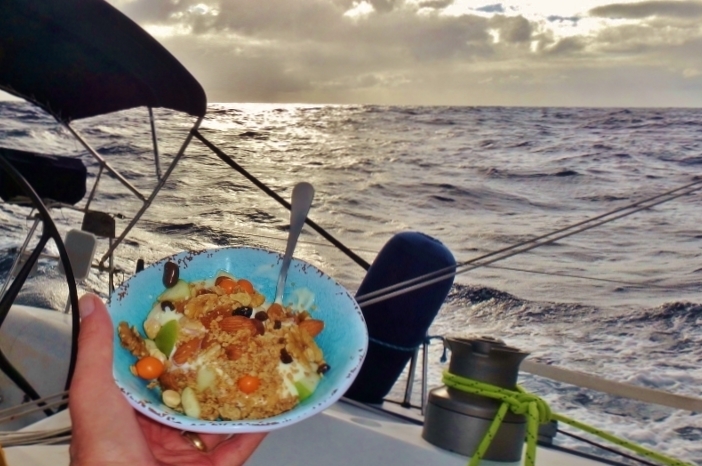 Even if your boat is a Privilege 60, and it is colored white, you should not announce on channel 16 that your boat is a White Privilege. The correct answer was confirmed by both Gibb and Harlan - both gybed (British spelling) and jibed (American spelling) are correct. However, "gybed" is cooler so we will be using that spelling exclusively here on the Official Blog of Record. We gybed again in the morning, so the mainsail is back at left wing, and the jib is back at right wing. 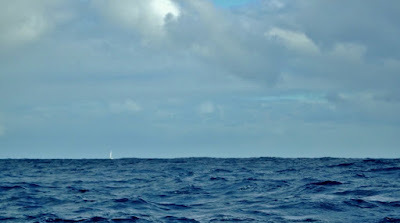 Seas were a bit more confused over the course of the day and we skirted a few squalls, but still mostly smooth sailing. In this configuration we can again get a fishing line in the water. We learned the painted cedar plug we used today was exactly as effective as the plain cedar plug we used Friday. 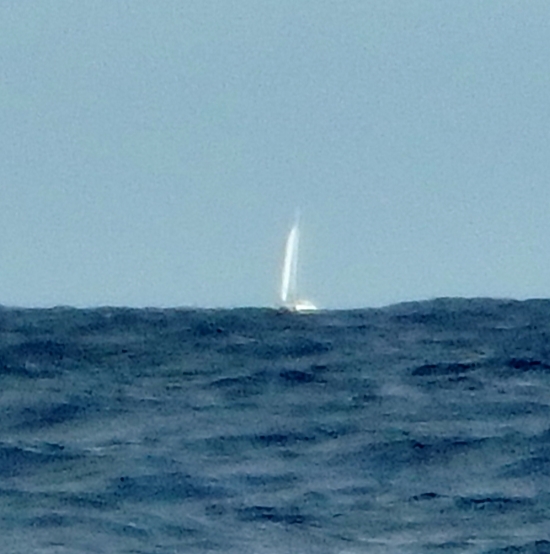 Three other sailboats were spotted today. I spotted a tricolor in the far distance on my early morning watch. 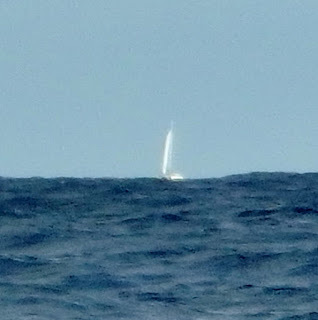 The boat was visible on AIS but it's name was not identified. I assume this was the catamaran King's Ransom, a self described "fat pig catamaran" that hailed us yesterday. 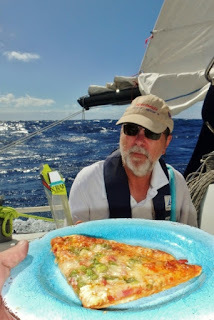 Jim spotted a sail about 2.5 miles off our starboard beam, which we soon learned from a Channel 16 conversation was the Zatara - a white Privilege 60. Don't blame us, that's what they said. Finally Kim spotted the Wiz on her watch late this afternoon. They are all heading for Antigua. They are all behind us now. Thanks to all the Cal Alum for texting the play by play to the Morpheus for the benefit of the Buffalo on board. Even though the game was over after the first three offensive plays, I was glad to hear the chirp of football updates form the community throughout the night. I am just gratified that my alma mater has made the transition from doormat of the Big 8, to doormat of the Pac 12. My intent is to post daily logs to my blog from SailMail. Due to the technology limitations, these will be short - text only posts. I'll backfill pictures and video once I am home again. New Port side jib sheet cover worn through due to chafe. Replaced w/ spare. boom vang bracket attachment screws (6 total) on underside of boom loosened. 1 presumably fell overboard 1 retrieved from deck. Reinstalled a/r with a spare and this will be watched.